Demetrios1453 replied to XGtE: are any of those flavor magic items any good? Beyond others mentioned in this thread so far, the Boots of False Tracks could find some good use for sneaky types who want to throw pursuers off or frame someone else, and what low-level bard wouldn't want an Instrument of Illusions? Demetrios1453 replied to D&D Products That Were Never Used By Anyone? I ran a whole 3e campaign in the Silver Marches, and used that sourcebook extensively. Demetrios1453 replied to Where do the 'Mordenkainen's Tome' Elder Evils come from? Ithyak-Ortheel and Borem are both FR as well, the former from the Moonshae Trilogy, and Borem was a being that Bane, Bhaal, and Myrkul slew on their path to become deities (but elder evils of course rarely remain dead). Piscaethces has long been the aboleth patron for D&D in general. Looking it up, she first appeared in the Night Below supplement, which is setting-neutral. I ran a game where the characters entered the Great Glacier (resulting in me using the book) from the south (from Narfell if I remember correctly). Interesting - I'll have to see what the archetypes and monsters/NPCs look like. I wasn't too interested until it was revealed it would contain those. Demetrios1453 replied to How serious is your d&d? 04:57 PM - lowkey13 mentioned Demetrios1453 in post Do you want Greyhawk updated to 5e? I suspect it's more like a very small number of posters making a lot of noise... (Quite frankly, there is good reason FR overtook Greyhawk in popularity). That's what happens when you place practically every video game in FR. And I saw more FR novels than nearly any other setting, except maybe Dragonlance. And that setting went downhill after Dragons of Summer Flame. Demetrios1453 and Parmandur : I didn't read any of the monster lore because as I stated, they were useless to me as I have my own lore for my own setting. And I figured they were FR focused since EVERY other book released has been (adventures minus Strahd, SCAG). Giving them names of Greyhawk characters really means nothing. So I made a mistake, but like I said, I didn't read the lore because it's rather useless to me. It's good to know it isn't FR focused, though. 09:37 AM - Coroc mentioned Demetrios1453 in post Is Dark Sun Coming To D&D? Demetrios1453 and Werebat There were large size creatures in 2e many weapons did more damge to These and some did less. Halfgiants were categorized as large, thri kreen were not. Halgfgiants had twice the hid dice to compensate (A halfgiant warrior had 2d10 Hp / Level) Constitution 20 and up granted Regeneration in 2nd ed so that was an additional potential advantage for those races who could rech this score. 05:56 AM - Parmandur mentioned Demetrios1453 in post Marathon, Broadway, and Catacomb: Upcoming D&D Products? Demetrios1453 an interesting thought occurs to me, as well, regarding Dragons: Dragonborn are the 5th most popular player race, after Han/Half-Elf/Elf/Dwarf, but probably the least developed: Ecology of the Dragonborn alongside other Draconic material...? 07:45 PM - Motorskills mentioned Demetrios1453 in post Enhancing "Storm King's Thunder"
03:01 AM - Motorskills mentioned Demetrios1453 in post Enhancing "Storm King's Thunder"
...from the Meditation room in Maelstrom, that leaves her an 8th and 9th slot (she needs the 7th slot to get home). An ancient Blue with the Foresight spell? That's what I call proper nasty. :D I am considering amping up the water pressure, that damage per round, and non-interference will act as if under a Slow spell. :) I will boost the numbers / stats of the residents, but the party will understand that they are there to convince the Princess S, not to get into a fight. Question, what is the air pressure in Maelstrom, is it normal? Edit 1: re Air Pressure - does anybody remember how it worked in the movie The Abyss? They had a diving pool there, and were able to walk around the facility without difficulty, but IIRC they needed more than simple diving suits when they went outside. But maybe it wasn't as deep as Maelstrom? What caused Michael Biehn's character to go nuts, was it the 'regular' air in the complex, or the oxygen mix in his aqua suit? Edit 2: Thanks Demetrios1453, I get to use another of your awesome inventions, link added. :) (By the way, there is an asterix in the wrong place for 2nd level slots). 07:32 AM - Lanefan mentioned Demetrios1453 in post Why FR Is "Hated"
11:09 PM - Caliburn101 mentioned Demetrios1453 in post Which Greyhawk? @Davelozzi and @Demetrios1453 Do you mind not spamming the thread with a VERY tangential sideline debate on mapping around Waterdeep et al and get back on to the topic - which is Greyhawk. I have added the Storm Giants Omen Reader by Demetrios1453 to the Giants section. It is from his great thread Homebrew Giant Elites , go there to check out his original work and some great flavor text regarding giants. Thank you Demetrios1453 for your contribution! I have also added the Storm Giant Paramount and update the Hill Giant Chief, Stone Giant Thane, Frost Giant Jarl, Fire Giant Duke, and Cloud Giant Oman to reflect the AD&D concepts proposed in the OP better. Primarily I gave them a method to mitigate stun-locks and ranged attacks to some extent. These should have been there originally, but I was going to fast. I have added the Cloud Giants by Demetrios1453 to the Giants section. These are from his great thread Homebrew Giant Elites , go there to check out his original work and some great flavor text regarding these giants. These giants differ a little from his originals, primarily I decided to make the giant Oman and Oathguard elites per the OP. Thank you Demetrios1453 for your contribution! I have added the Fire Giants by Demetrios1453 to the Giants section. These are from his great thread Homebrew Giant Elites , go there to check out his original work and some great flavor text regarding most of these giants. These giants differ a little from his originals, primarily I decided to make the giant chiefs (thane, jarl, etc.) elites per the OP. Thank you Demetrios1453 for your contribution! In addition to adding the fire giants I have update the the Hill Giant Chief and Frost Giant Jarl slightly. 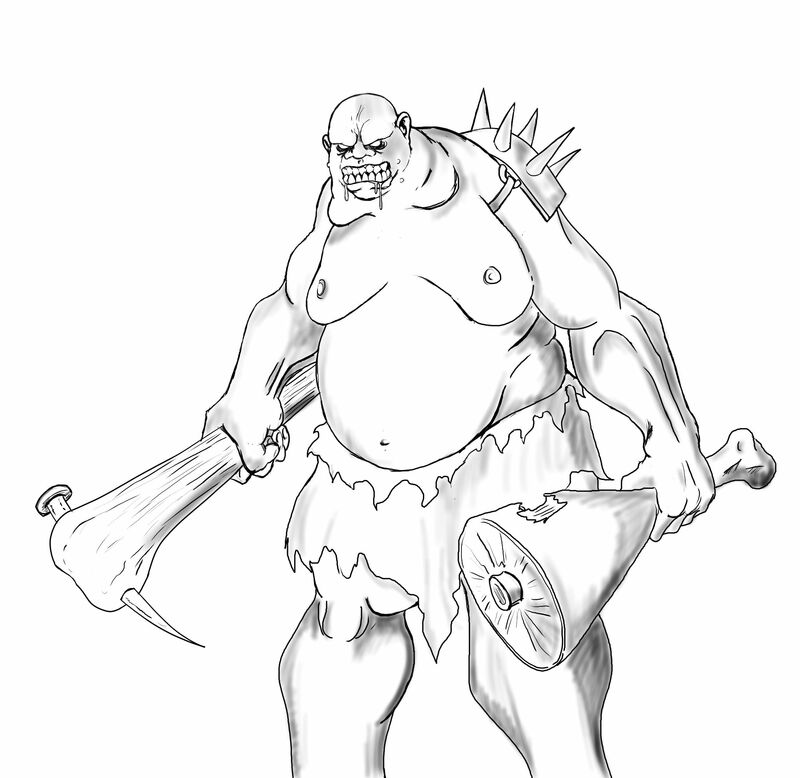 I have added Hill Giants, Stone Giants, and Frost Giants by @Demetrios1453 to the Giants section. These are from his great thread Homebrew Giant Elites , go there to check out his original work and some great flavor text regarding most of these giants. These giants differ a little from his originals, primarily I decided to make the giant chiefs (thane, jarl, etc.) elites per the OP. Thank you @Demetrios1453 for your contribution! Any chance you could (both) make these excellent projects available on Google Docs or similar, if not already done? When I get a few more entry's in my thread (which will eventually include Demetrios1453 giants) I will add a PDF version to the downloads section of this website. Probably the end of March or April. I can make a google doc too, but I probably would not update that as often. I have already done that for the Epic Monster Updates. Demetrios1453 did you mind if I reformat (word and PDF) your wonderful giants and included them as part of my AD&D Monster Manual? To be honest, someone who puts such heavy conditionals on buying the books is probably not worth the effort of chasing. It seems likely that you'd never buy the books, not matter how good they were at meeting your conditions, if you got this far without doing it. I can't fault anyone for wanting what they want...but threads like these certainly hint at the challenges that the WotC team faces on what to produce and how. For every person who says they like what they're doing, you get one who hates it, one who likes it but wants to also see X in addition, then people who just disagree with what he said or say he's lying...and every other kind of response imaginable. No no matter what they do, there are going to be people who will be disappointed. It's just the way it goes. I think that Demetrios1453's speculative tripartite split for future books is a very coherent idea. It does mimic the Planescape Boxed Sets that I have purchased in PDF - a Player's Guide to the Planes of Chaos, a DM's Guide to the Planes of Chaos, a Monster Supplement, and an Adventures in the Planes of Chaos booklet. Added together, they probably would come in at less pages than a modern hardback... I agree, that was a great point by Demetrios1453, and I think that approach seems the most rational given the diverse audience they are trying to appease, while also trying to grab new players. Demetrios1453, ad_hoc or Prism: What does the book say about Elturgard? I ask because the 4e LFR adventures had the Companion exploding and the nation failing, but the nation still exists and the second sun still hovers over Elturel in Hoard of the Dragon Queen, so it would seem that the LFR storyline was non-canonical. On a related note, Ohlen has just released a Baldur's Gate adventure/regional setting guide on the DM's Guild, officially set between the two Baldur's Gate games, but apparently with notes on how to update it to the current setting date: https://www.dmsguild.com/product/269398/Heroes-of-Baldurs-Gate A hell of a debut year for any RPG designer. That illustration with an angel and fiendish hands really seems to point towards something planar. Should, like normal, we see two products in the fall (and the description definitely mentions "products" in the plural), I'm leaning towards the normal September release being an adventure (presumably planar in nature) and the November release being a riff on the various Manuals of the Planes/Planescape. Should the adventure focus on the Nine Hells, that would likely mean we'd get more or less a guide to the plane in that book, opening up the large amount of room the Hells normally take up for other places in the sourcebook. I would be quite happy about this if it should come to pass... Volo's Guide to Spirits and Spectres perhaps. 09:08 PM - Satyrn quoted Demetrios1453 in post How serious is your d&d? It's funny - nowadays when someone mentions a "gritty" campaign, thanks to the Philadelphia Flyers' mascot, I'm imagining something quite different from what they are! (And what would said Gritty campaign look like? Perhaps the wacky hijinks of a larger orange monster - perhaps a reskinned goliath or something similar - and his group of sidekicks - heavily armored fighters armed with some unique staff-slings, and one really heavily armored defender - as they go around the countryside taking down devils, sharks, coyotes, panthers, knights, rangers, and so on. They might even take on senators and kings! Even penguins and maples might be dangerious...) The boss fight is a dire bear wielding a wand of lightning bolts. 10:24 PM - Gradine quoted Demetrios1453 in post How serious is your d&d? And if they do do a Planescape-themed AP, they've mentioned the Great Modron March in numerous books so far, both in rulebooks and adventures. It would be a pretty good way of introducing the Outer Planes, moving along with the modrons around the Great Wheel, and each location would likely be designed to be modular, able to be lifted with little tinkering to be used as an adventure location in a homebrew campaign (need a fortress on Avernus or the Plain of Infinite Portals (or anywhere in the Hells or the Abyss really)? Just lift it from this book!)... Perkins has been laying a lot of groundwork about Modrons for a couple years: sure he plans to pull that trigger in some way, at some point. Not upset at all. I'm paying $50 for a lot of other content, and the color/style of the maps is immaterial as long as they are usable. Ugh. The fact that people AREN'T upset by this is UPSETTING! I will say I'm kind of bias tho... I do all my playing on the Fantasy Grounds VTT and having black and white maps just seems wrong. But I buy the books ($50) and I also buy the FG modules ($25) and the DnD Beyond version, so I'm in for $100 each time they release a book. I only really need the Fantasy Grounds version but I'm a freak and have to have it all, I just wish the maps were color. 03:46 AM - SkidAce quoted Demetrios1453 in post Artificer UA has been released! ...And those who try to say that Greyhawk shouldn't have any tieflings simply make me shake my head. What have Iuz and the Great Kingdom been doing for decades? There's minimal difficulty with introducing tieflings to the setting given the history we already have! And cambions. Quoted for truth. 07:02 AM - Hussar quoted Demetrios1453 in post Artificer UA has been released! I agree with you that they were pushing it a bit for some settings (such as Greyhawk), but the examples they gave for the Forgotten Realms and Dragonlance are spot on and fit just fine with those settings' established canon. They probably should have just added a line like "Artificers don't necessarily exist in every world, so ask your DM before creating one", similar to the statement on how "uncommon" races don't exist in every D&D world in the PHB... Heh. It's really funny how we all have different take aways from different settings. You mention this not fitting in Greyhawk. But, GH is a setting with fallen spaceships (multiple), one of the iconic wizards of the setting uses six-guns, and one of the first encounters in the Slave Lords modules involves a wagon mounted flamethrower and goblins (or orcs, I can't remember). The notion that artificers wouldn't fit in GH seems strange to me. 06:11 PM - Bacon Bits quoted Demetrios1453 in post Do you want Greyhawk updated to 5e? What does any of that last paragraph have to do with Saltmarsh and U1? You tell me. You're the one that said replacing a country was the same as replacing a sea. 04:51 PM - Bacon Bits quoted Demetrios1453 in post Do you want Greyhawk updated to 5e? 04:55 PM - lowkey13 quoted Demetrios1453 in post Do you want Greyhawk updated to 5e? Watching the Kate Welch video makes it sound like the non-adventure section of the book is going to be pretty substantial. I'm hoping for a relatively robust bestiary section myself... For those familiar with the adventures in question, how many pages do they run, and what would be a likely page count for them collectively in this book? My page counts may not be perfectly right (DUNGEON ads, very different text formats, etc.) but are in the right ballpark... U1 - Sinister Secret of Saltmarsh 30 pages U2 - Danger at Dunwater 30 pages U3 - The Final Enemy 46 pages Isle of the Abbey (DUNGEON #34) 12 pages... maybe less from ads Salvage Operation (DUNGEON #123) 9 pages Tammeraut’s Fate (DUNGEON #106) 29 pages... a bit bloated from 3e stat blocks The Styes (DUNGEON #121) 23 pages So roughly 179 pages altogether. As expected, the over-wrought worrying by some posters here fearing that Greyhawk would be overlooked was completely unfounded. I'm curious where they will suggest placement in other settings though... For the FR, I'd reckon the Sword Coast, or the western part of the Sea of Fallen Stars somewhere. 03:48 AM - Parmandur quoted Demetrios1453 in post Pages From The Upcoming Nautical D&D Book! Sneak peaks generally indicate that an announcement is relatively imminent. Yeah, and these previews tip their hand pretty significantly: doubt they would do that unless the whole story is going to be broadcast soon. 08:01 PM - vpuigdoller quoted Demetrios1453 in post Pages From The Upcoming Nautical D&D Book! Hopefully that combined with some overall water/nautical rules and at least a bit of a bestiary. I think is worth noting that at least the U3 booklet included some rules for underwater adventuring in the introduction in page 12. As far as I know there is no mention of rules for underwater adventures in U1 or U2. Maybe rules is not the right word lets call it guidance. 05:28 AM - pkt77242 quoted Demetrios1453 in post Pages From The Upcoming Nautical D&D Book! I agree that it would be weird to start with U3 and the page count was quite possibly altered along with the joke name. If they do update the full U series, what else could we expect in the book if it were all adventures? We know it's going to have a nautical theme, so I'm trying, and struggling, to come up with another classic ocean/water-themed adventure. If it doesn't turn out to be "Tales from the Yawning Portal for water", I would have to believe my theory earlier in the thread would be reasonable - a water-based update to the ruleset, a bestiary, and the updated U series... X7 The War Rafts of Kron would be another adventure that would work in a book like that. 12:17 AM - vpuigdoller quoted Demetrios1453 in post Pages From The Upcoming Nautical D&D Book! Hopefully that combined with some overall water/nautical rules and at least a bit of a bestiary. I agree!! This has me very intrigued and excited! 12:16 AM - dave2008 quoted Demetrios1453 in post Pages From The Upcoming Nautical D&D Book! Hopefully that combined with some overall water/nautical rules and at least a bit of a bestiary. Well they at least need Sea Lion stats! Also, most of the Adventures have had a bit of bestiary.